Thomas Fitzpatrick, aka: Broken Hand (1799-1854) – Born in County Caven, Ireland, he immigrated to America in about 1816, where he soon became involved in the Indian Trade. On February 13, 1822, William Henry Ashley, who co-founded the Rocky Mountain Fur Company, placed an advertisement in the Missouri Gazette and Public Adviser, calling for 100 enterprising men to “ascend the river Missouri.” Fitzpatrick applied and soon became part of the trapping group referred to as Ashley’s Hundred, along with several other would-be famous mountain men including William Sublette, Jim Beckwourth, David Jackson, Hugh Glass, James Bridger and Jedediah Smith. 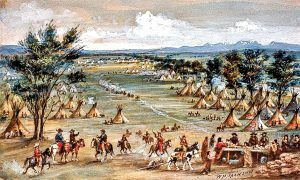 On June 1, 1823 Ashley and his party of 70 men were attacked by 600 Arikara Indians, inciting what is known as the Arikara War. Twelve of Ashley’s men were killed and the rest were forced to retreat. Over the next several years, he continued to work as a trapper, and with Jedediah Smith, he led a trapper band that discovered South Pass, Wyoming. In 1830, he and four other men purchased the Rocky Mountain Fur Company, which he became the head of. Two years later, he played a prominent part in the Battle of Pierre’s Hole, Idaho. During these times, he had several near death brushes with Indians and suffered many hardships and his hair grayed to such a point, he was sometimes referred to as “White Hair.” In 1836, he sold his interests in the fur company, but continued to independently hire out as a guide to the American Fur Company. He also guided the first two emigrant wagon trains from Missouri to Oregon, was official guide to John C. Fremont on his longest expedition in 1843, and the following year, guided Colonel Philip Kearny and his Dragoons to the mountains at the outset of the Mexican-American War. Later, he became the Indian Agent for the Upper Platte and Arkansas Rivers, in which he counseled with the Cheyenne at Bent’s Fort in 1847, with the Indians on the South Platte River in 1848, was instrumental in organizing the Fort Laramie conference in 1851, and was involved in several other treaty negotiations. While in Washington, D.C. in 1854, he got sick with pneumonia and died on February 7, 1854. He was buried in the Congressional Cemetery. During his lifetime, he married a woman of mixed French-Snake ancestry and fathered to children. He was nicknamed “Broken Hand,” because his left hand had been crippled in a firearms accident.